There are different types of reactors for marine aquariums. 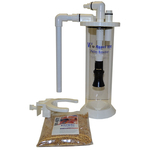 Some have sand in used as a fluide bed filter, some have pellet or beads in. Calcium aquarium reactors in marine aquariums help balance alkalinity, too. An acidic solution is created inserting carbon dioxide into a compartment with salt water and calcium-rich media.